The spirit of the Renaissance is a thread running through all aspects of Rochester Hills, MI artist Michael Genova’s art and life. From his first epiphanic encounter with the statue of Moses by Michelangelo, the course was set for his striving to create beautiful and inspiring Catholic imagery as the artists of that period perfected. This pursuit led him to study sculpture, drawing, and art history in Florence, Italy, and to later complete his studies receiving a BFA in animation and digital media from Detroit’s College for Creative Studies. 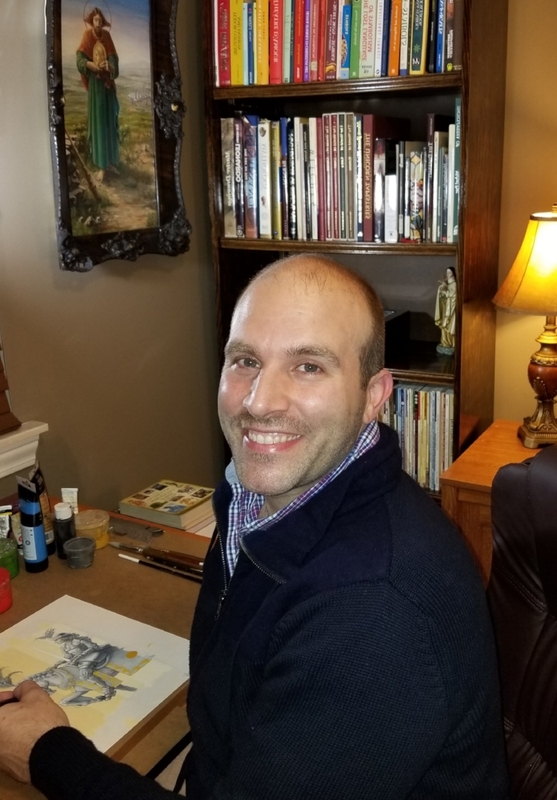 Michael aims to utilize harmonious design, symbolism and a wealth of inspiration from religious and secular stories to depict Christ and the saints illuminating the truth and wisdom of Christianity. These should not be seen as just decorative pictures but, as Michael feels, through beauty and truth these images can have a profound effect on one’s life. In contrast to the contemporary focus on personal expression, where viewer dialogues with artist, he is resolved to let the viewer communicate with the subject matter and message, as the early Renaissance artists believed; the images can speak for themselves in the light while the artist remains content in the shadows. Delicate colors blend together for lifelike nature scenes or combined with fine black ink line work for breathtaking architectural renderings High quality framed and matted art prints are available for purchase with a variety of sizes and frame styles to perfectly complement your home decor.